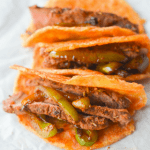 The best part about these Keto Steak Tacos on Pork Rind Tortillas is they are extremely low carb. With so few ingredients, they are sure to become a fast favorite! Confession time. I’ve never been very good at cooking steak and I’ve hardly spent any time eating it. But when I got a huge, delicious package of meat in the mail from Butcher Box (affiliate), AND a new pan to try out in the kitchen… I knew it was time for that to change. I love a good tortilla, and I know you do too. They’re perfect for making wraps, nachos, and my favorite…tacos. 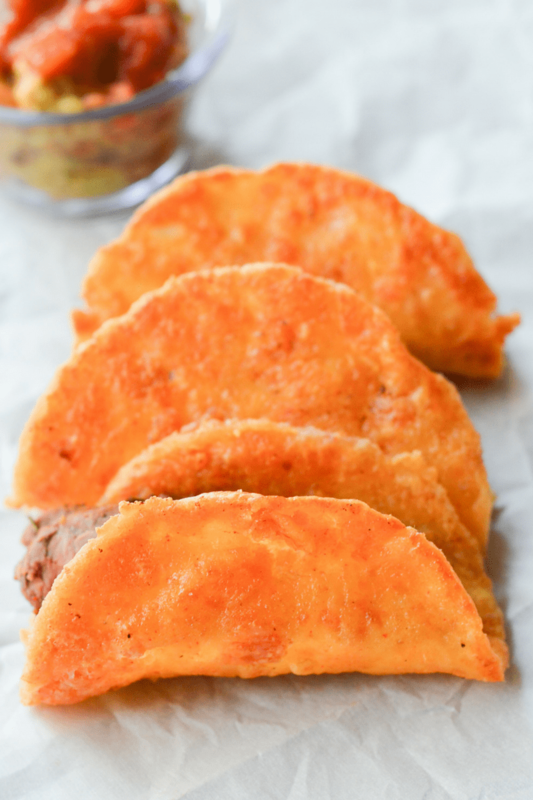 Not to discredit my other favorite…cheese shell tacos, but the recipe I’m sharing with you today is pretty awesome. There’s a lot of debate over whether low carb tortillas are “truly” Keto. I’m not going to get into that today…but I will squash the debate with an alternative you can make right now with three Keto staples. I never realized how versatile Pork Rinds can be. They are beyond useful, zero carb, and in this recipe you won’t even be able to tell you’re eating them. With a special blend of unflavored pork rinds, egg, cream cheese, and mozzarella I created an incredibly yummy, guilt free dinner that filled everyone up, and made them crave more. The Nutrition Info below is JUST for the Pork Rind Tortilla. There are a million different ways to customize your tacos, so please calculate your own nutrition based on what you decide to put in them. These turned out great. Good flavor, nice crunch. 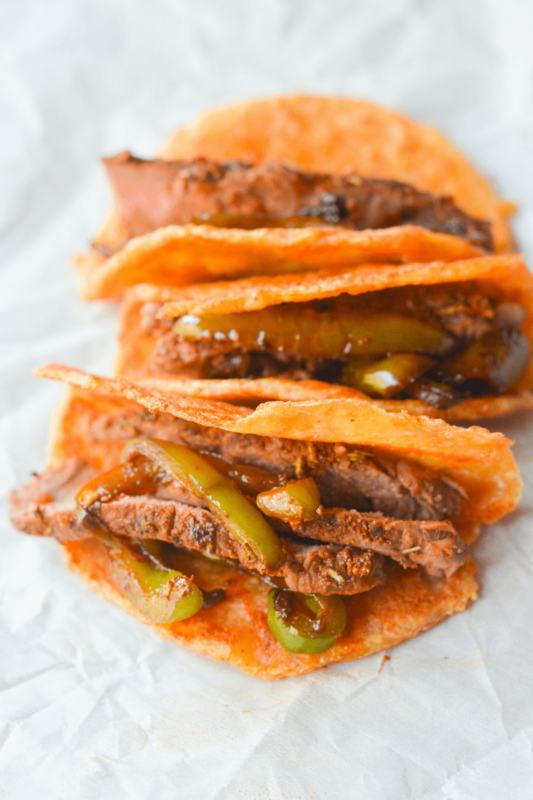 I used my taco press, which made things a lot easier and faster. I cooked one and stored the rest in the fridge separated with parchment paper. Thanks for the recipe! So glad to hear it! That’s a great idea! Why do people rate a recipe they have yet to fix? Ratings are for After you try it And follow the directions, as this is the only way to know what you think of the recipe. Otherwise, people get all excited when they find a 5 star review, only to be let down when the reviewers haven’t even tried it yet, or totally changed the recipe, then say it was terrible! Just sayin’! The recipe does look good, and I look forward to trying the tortillas! How many tortillas does this recipe make? Does the recipe call for one cup of pork rinds before crushed or after crushed…..i’m thinking that would make a huge difference. I want to try these, but want to make sure I’m using the right amount. Thanks! A cup of crushed. I usually take the whole bag and dump it in the food processor, then measure a cup out of that. Then I store the rest in a sealed bag. Hope that helps! Omg, you are a genius! Pork Rind tortillas sound amazing. This is also perfect because I can make these for myself and my carb loving family can have the regular flour tortillas. Im just researching to start on Keto and this will be a big help. Thanks so much for sharing. Could you prepare these and then store in the fridge or freezer to be heated up later? Thank you. These are awesome. My daughter likes these better than corn tortillas. My son is not keto but likes them. I am much happier with this than the plain cheese taco shells . Less than 1 carb per tortilla! ???? You made my day. YOu are an angel! Can’t wait to try these. These seem very promising but I feel like I missed something. How do they end up taco shaped? If you simply cook then flip and cook the other side they would be flat and if they are pliable enough to fold over after cooking they would just collapse. Please advise. Thank you! What brand are the pork rind please? Are these just store bought pork rind already cooked that you have as a snack? I don’t believe in posting comments until the recipe is made either as another mentioned. I did make this tonight and was not impressed. Followed exactly as recipe indicated. Will not waste my time again to make. Made these Keto shells with hot and spicy pork rinds. They were so tasty! My boyfriend loved them. I made these last night and YUM!!! I made 4 larger ones instead of 6 small ones. BUT…I found I could only eat just one before I was stuffed!! 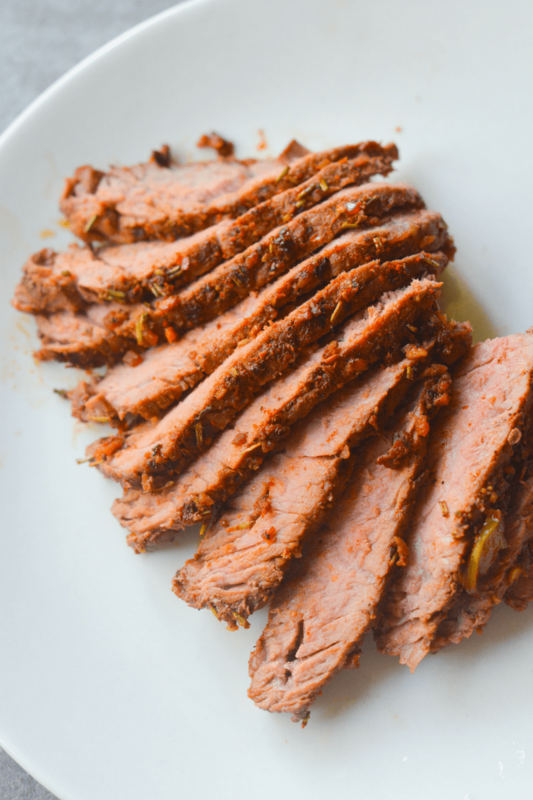 I had a green salad with it, and instead of steak I had some shredded pork that I used with my own taco seasoning. When my son’s girlfriend saw it she said that was the first meal she ever made my son. But she turned her cupcake pan upside down and spread the mixture over the it, then baked them and they came out great! I’ll try that next week when I make them again. So good! Thanks for posting this recipe..
these sound so good i will try it soon since i just had tacos last night with regular flour tortillas i was shocked by my sugar level this morning i am a diabetic and carbs are a great no no for me. thanks for the site and recipes. So sorry there was an error with the recipe card which is fixed now. I’m not seeing the actual recipe and am hoping someone can add it to the comments or back to the post! Sounds very promising. So sorry there was an error with the recipe plugin which is fixed now. Do you think these would turn out okay without egg?